Nitish Kumar will lead Canada team in the tournament. After their resounding showing at the recently concluded Global T20 Canada, the West Indians no doubt will be looking to continue from where they left off by being the beaten finalists at the aforementioned facility. Vancouver Knights were the eventual champions led by West Indies high-profile pugnacious left-handed batsman Chris Gayle. The round-robin format will see the four participating teams in action from 11:00hrs when Toronto Bears tackling a Canada “A”side while at 15:00hrs, West Indies “B” and Canada senior boys in confrontation. The competition continues on Sunday with two more matches while on Monday, Labor Day in Canada, the final round will be played. According to unconfirmed reports, the winning team will collect a trophy and an undisclosed amount of cash. West Indies “B” will then continue their tour of Canada with two 50-over games against the Canadian National Side also at King City on September 5 and 7. Head coach of the West Indies “B” team Esuan Crandon stated just before his departure to North America, that he was extremely excited to be given the opportunity to coach the team at this tournament which was organized by Cricket Canada. According to the former Guyana fast-bowler Crandon, the team will obviously get a great chance to display their talent on another foreign soil. 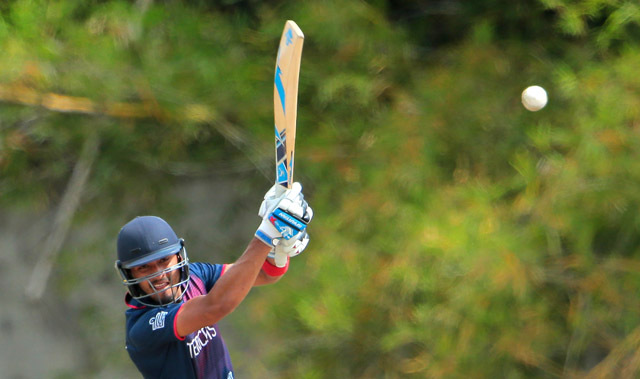 ing forward to a very exciting tournament with some exciting players in the squad,” stated the 36-year-old Crandon, who appeared in 38 first-class matches for his country. Crandon’s compatriot Anthony Bramble is the skipper of the team which included a nucleus of the players that represented the West Indies side in the Global T20 Canada. The national wicketkeeper/batsman Bramble skippered the team to five impressive victories out of their seven encounters. Meanwhile, former Guyana youth cricketer Dillon Heyliger is very delighted with his selection in the Canadian side for this tournament. Heyliger and quickie Jeremy Gordon are the lone Guyanese in the squad which is expected to use it as part of their preparations for next month’s ICC World T20 World Americas Group “A” Qualifiers in the USA. “I’m honored to be selected again for Canada and of course and looking forward to keep up the good work,” the right-arm bowler and batsman declared. Heyliger was also in the thick of things at the Global T20 Canada representing Montreal Tigers. However, the Tigers did not make it to the play-off stage but Heyliger said he would definitely use that experience to make an impression from Saturday. “Well, I bring that same spirit from the Global tournament; the exposure was great and I am greatly motivated to make Canada proud,” mentioned Heyliger. The Canadian side will once again captain by Nitish Kumar, who also put in measurable performances in the Global T20. Kumar came out for Toronto Nationals who were left in the cellular position. Canada squad reads: Nitish Kumar (Captain), Cecil Pervez, David Jacobs, Dilon Heyliger, Hamza Tariq, Jeremy Gordon, Junaid Siddiqui, Navneet Dhaliwal, Nicholas Kirton, Nikhil Dutta, Rizwan Cheema, Saad Zafar, Satsimranjit Dhindsa, Srimantha Wijeyeratne.